Your choice of contractor has the potential to make or break your project. Make sure you choose an experienced contractor like Cabinet Magic for your Kitchen remodeling in Laguna Niguel CA. As a licensed contractor, we can take you through every phase of the project with ease, from the initial design planning to sourcing the best designer materials–including custom cabinetry–to installing and finishing everything to a high standard. Kitchen remodeling in Laguna Niguel CA sometimes requires a leap of faith as you go from your sample selections to the real thing. After all, what if the countertops, flooring, paint colors, light fixtures, or other design elements you’ve chosen don’t look quite right when they’re all put together? 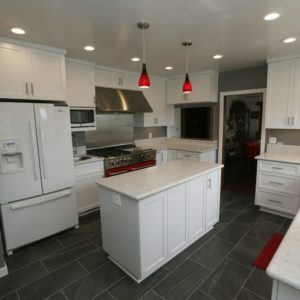 At Cabinet Magic, we believe being able to accurately visualize your kitchen remodeling in Laguna Niguel CA before work begins is key to being satisfied with the final result. That’s why we offer 3D computer rendering services on every remodeling project. You’ll be able to see and approve all aspects of the design down to the last detail before we begin work. The centerpiece of any kitchen design is the cabinetry. At Cabinet Magic, we can create the exact cabinets you want right here in our La Habra CA factory. Our skilled craftsmen can create any style of cabinetry and of course you will have your choice of finishes and accessories. All of our cabinets are built to a high quality standard incorporating high end features like soft-close hidden hinges and smooth drawer slides. Are you ready to stop dreaming of kitchen remodeling in Laguna Niguel CA and start actually making it happen? Call Cabinet Magic at 800-828-4380 now and request your free in home consultation. We’ll go over your wish list with you and provide an estimate for the necessary remodeling work.